At the Benedictine convent Sant’ Andrea most of the year and in the church San Michele Arcangelo on the town plaza from the 3rd Sunday of November till the second Sunday of January. I don't often include copies of famous Black Madonnas in my index, but this one has such a distinct character and Emilio Giovannone's photos are so good that I couldn't resist. A copy of the Madonna of Loreto has been venerated in Arpino since the 17th century. Procession to the church of the archangel St. Michael every 3rd Sunday of November. She stays there for her feast day on December 10th and returns to the nunnery on the second Sunday of January. The nuns guard her jealously, because she was given to the convent as the dowry for one of the nuns by her father, at his daughter’s request. The Black Madonna was sculpted in Loreto. The base on which she is carried in procession was ordered by the abbess from sculptor Michele Stolz. During her festival, the mayor deposits the keys to the city at the foot of the Madonna, as a way of honoring her as the patron saint of the city. 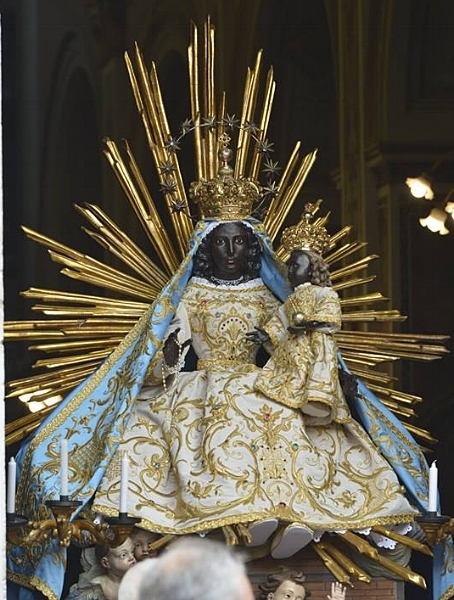 Usually a large group of air men pay their respects as well, because, since the Holy House of Loreto is said to have flown on angels’ wings from the Holy Land to Italy, the Black Madonna of Loreto is the patron saint of the Air Force and pilots in general.